Flames captain Limbikani Mzava has extended his contract at Absa South African Premier Soccer League (PSL) side Lamontville Golden Arrows. Arrows exercised a one-year option on the contract to keep the striker for another two years. 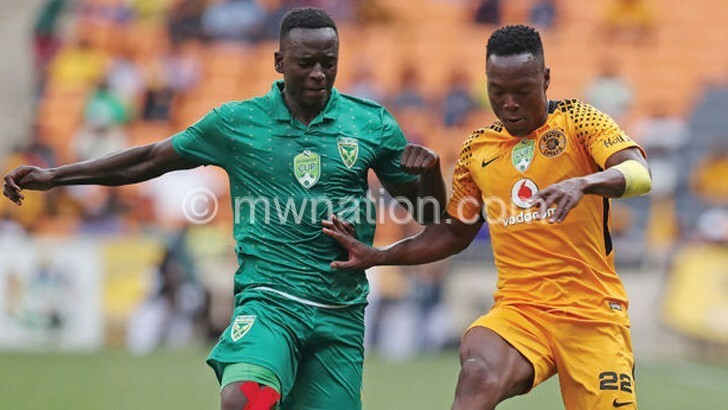 “Yes, I’ve extended my contract, but we took the one-year option that was there at the beginning when I signed with the club in 2016,” Mzava, who is back home on off season holiday, said. Mzava initially joined Arrows amid interest from Orlando Pirates in 2016 from Mpumalanga Black Aces, having previously played under Abafana Bes’thende coach Clinton Larsen at Bloemfontein Celtic. The former TNM Super League defender of the year award winner has for the second time in a row been named the most capped player for his South African club. He finished the season having played 32 games just like last season. In 2016/17 season he finished the season having played 32 games and he did again in the 2017/18 season with the same number of games played. He had 29 appearances in Absa Premier Soccer League (PSL) in which he was in first team and scored two goals from the spot. He also played a game each in Nedbank Cup, Telkom Knockout and MTN8. The Kwazulu-Natal-based outfit had a mixed season and managed to secure a top eight finish for a second consecutive time.